Wedding Cake Toppers. Hand Made Personalised Wedding Cake Toppers. I love it when I am sent photos of the toppers from the special day. 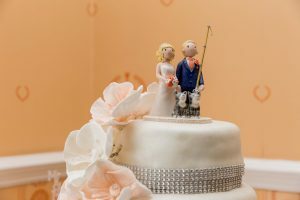 This fishing cake topper was no exception. The groom loves fishing, so it was great to be able to incorporate that into the topper. This one has a great fishing rod added, which adds a really fun touch to the topper. Fishing is one of the most popular hobbies in the UK so it’s no surprise that I have been asked to make fishing themed cake toppers! Recently I made a topper where the bride was fishing for the groom! There are lots of ways fishing can be incorporated into a topper. Fishing rods are the most obvious. But I can also add welly boots, bait box and even some water! (pottery water of coarse) A few years ago I made a topper with the groom hiding a fish behind his back. It can be a more subtle addition as well with maybe little fish painted on the base, or the bride and groom wearing fishing badges. It can be as much or as little as you would like. The colour scheme works really well with the room as well. The accessories were all an orange and peach theme. The grooms cravat and handkerchief were a coral colour. The brides bouquet and the grooms buttonhole were a mix of white, coral and peach flowers. The coral and the orange colours are a lovely contrast against the white. The bride and groom also wanted to add their pets to the topper. So this topper also has two lovely tabby cats. Pets are definitely part of the family, so I always think it’s such a lovely addition to add pets to the topper. There are two sizes of toppers available.